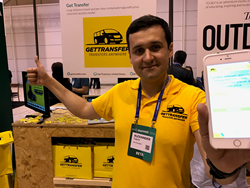 In November 2016, during its foundation year, mobility-startup GetTransfer.com participated for the first time in the Lisbon WebSummit conference. At that time, GetTransfer.com was little more than an alfa-version in its infancy. Since then, the company has made a quantum leap in terms of proof of concept, customer acceptance and growth. For its second participation at WebSummit, GetTransfer.com is now presented in the conference’s Start Category, reserved for the most promising and fastest growing companies. "We have been following the development of GetTransfer.com, as one of our conference Alumni, and we are pleased to see its development as well as the confirmation of its potential. We believe that this year's conference can offer the company a further platform to team up with investors and fuel its future growth," comments Patrick Griffith from WebSummit's organising committee. GetTransfer.com currently facilitates more than 3,000 trips per month and the platform has registered more than 7,000 cars worldwide. The company aims to achieve the lowest prices for pre-booked, longer distance transfers in - mainly - Europe and the USA. It works with existing transportation operators and optimises existing capacities of drivers. Company has unique API and iFrame solutions for B2B sector. Keeping prices low while providing a high-quality service – that is GetTransfer’s unique value proposition. “We strongly believe in the long term potential of GetTransfer's business model as well as in the strong team that is building it. Hence, we were very happy to become an early partner in one of the fastest growing mobility startups,” says Peter Vanhecke, Partner at Castel Capital. “We continue working hard developing new mobility solutions, which we offer to our customers. One of our product initiatives is offering our clients the option to share rides. Also, during WebSummit GetTransfer’s special promocode WS71 offers a -7% discount for its services world wide,” says Alexander Sapov, CEO of GetTransfer. GetTransfer.com is an online service-discounter for transfers and car rental with driver. It provides the best prices for long-distance trips from airports, train stations and between cities. At the moment, the company is present in more than 100 countries around the world https://www.gettransfer.com/.